Aims to spark and nurture young brains. It offers multidisciplinary curious questions, informational and educational content. 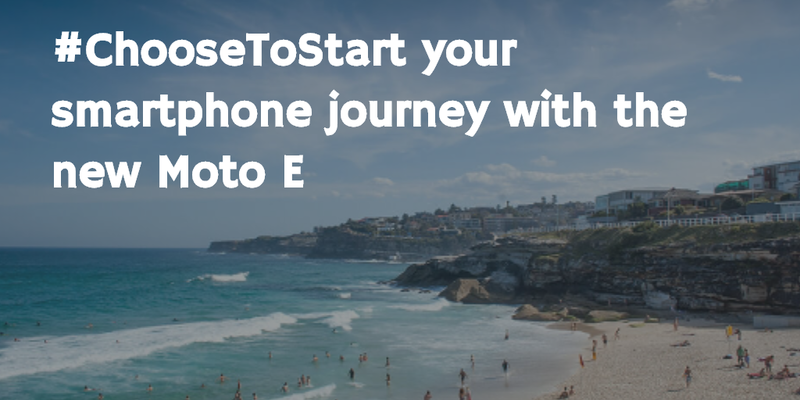 #ChooseToStart your smartphone journey with the new Moto E and have this amazing experience. The new Moto E has a front-facing camera for taking selfies with your loved ones and friends. Just twist your wrist to open the camera app and enjoy capturing photos and videos instantly with great ease. It has 5-megapixel auto-focus rear camera with burst mode, 4*digital zoom, panorama, and HDR. The new Moto E has a sharp and clear screen with 4.5-inch display, a comfortable size to hold in one's hand and handle. The new Moto E has colorful bands on the top which are interchangeable. I like this feature as it gives a new look to the phone every day and gives better grip and also protects the phone from the danger of slipping down. I love its new 3G version and it is really amazing. With Android Lollipop in new Moto E, you can stay connected with your friends anywhere, join video calls, and can also capture and share photos and videos in a high speed with smart Internet connections which are speed and secure. The new Moto E runs on the Qualcomm Snapdragon 200 processor with 1.2 GHz quad-core CPU and another important thing, it is running on the latest OS - Android 5.0 Lollipop and alongside it has 1 GB RAM, 8 GB ROM for storage and it is expandable up to 32 GB using the external micro SD card. It has blue tooth and it is Wi-Fi enabled. And so, without doubt, with Android Lollipop in new Moto E, you can watch streaming video shows, ART run time enables optimized application performance, play games, capture videos and photos, enjoy real-time navigation and its latest software enables users to handle tasks quickly from Internet Banking to online share trading without hassle and you can download more music and apps and also you can share them faster. In short, the new Moto E is the great phone which gives users a premium smartphone experience in an affordable price. The new Moto E has a slightly curved back and its attractive design makes it look elegant and stylish. One need not worry about scratches and minor knocks as its display is protected by Corning Gorilla Glass 3. It has an anti-smudge coating and I like to say it as a great premium feature of this new Moto E model because it keeps the fingerprints away. No smudges and so you can carry a phone which looks almost new even after you play games and use a lot. Additionally, you can spice up and customize the look of your new Moto E by just interchanging the top bands. The interchangeable backs called Motorola shells gives protection and new look to your phone every day and you can carry it with pride. The new Moto E running with Android Lollipop has material design which is colorful and mind-blowing. It also responds to touch in an intuitive way which makes you love your new Moto E more and more. The new Moto E has multiple user account option. Assign guest mode which has only limited access to calling and texting when you want to share your device with others. This feature protects your privacy and so without tension, you can spread the love of Moto E by sharing your phone with your friends, family and others for experiencing excellent call quality and for other purposes. You can also share the love of new Moto E with your kids without tension as it is water-resistant. Secondly, the screen pinning feature allows the child to access the particular app or page and they can't navigate anywhere else and so you can share your Moto E device with your child. It has long battery that can last up to 24 hours of usage so you need not bother about battery even if your child play games. The new Moto E has Android Beam which lets you share a file with someone nearby by gently tapping the two devices together. * Customize the theme and icons in your new Moto E phone. Get premium Moto experiences like Moto Display for notifications and updates without interruptions of work and Moto Migrate to quickly and easily transfer contacts, photos and videos to your new phone. * Customize when and how you should receive messages and incoming calls and as a result, you won't get interrupted when you are playing or doing any other task. So with this feature, you can get interrupted only when you want to be. In this, sensitive content can be hided and you can also set, to get notifications only from certain people by turning on the Priority mode. * Easily you can view and respond to messages directly from your lock screen itself. * Use Android Smart Lock to easily unlock your phone, multi-tasking another useful feature which helps to switch apps easier and for many tasks, it is helpful. Battery power saving mode support is provided and many more features are in the new Moto E to help you do your work without interruption. Hope, you all love the six things which I #ChooseToStart with the new Moto E!